Managing the files and reference materials that you’ve compiled over the course of a project (or even your entire career) can be a daunting task. You need to organize invoices, proposals, creative files, mock-ups, research sources and a myriad of other folders and files for later reference. And let’s face it: most operating systems have inadequate file management tools for power users. Below are a number of apps and resources that you can use to manage your files and resources. Some are Web-based, some desktop-based and some are analog (i.e. paper-and-pen-based). The one that’s right for you will depend largely on your workflow and what you need to keep organized. A number of online tools are out there to organize your references and even your files in some cases. Below are some of the best. An online tool might work best for you if you do a lot of research for your projects or if you need to be able to access your information from multiple computers. 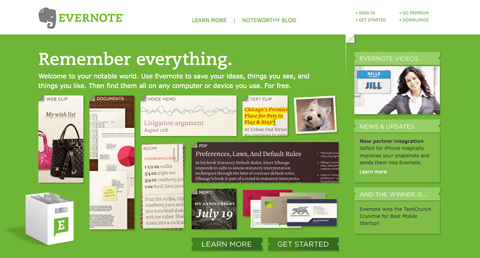 Evernote is an online notebook that lets you capture information from all over the Web and then access it from anywhere. You can add notes, add media files, take screenshots and more. Evernote indexes all of your information automatically, and you can add tags and keep separate notebooks for separate subjects. Free and premium ($5 per month) accounts are available. 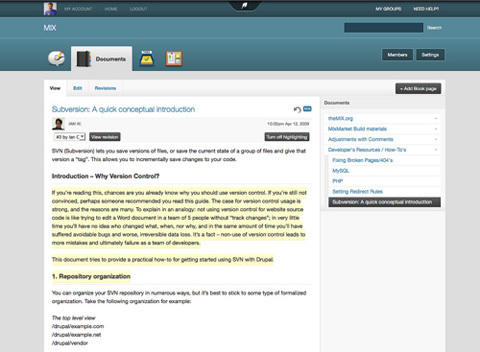 Open Atrium is really an open-source Intranet platform, but it has features useful for keeping track of research and projects, most notably a wiki and blog feature. Because it lets multiple users share resources, it’s a great solution to consider if you need to keep multiple team members connected and informed. 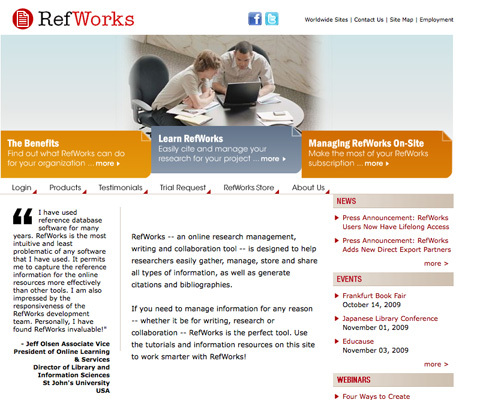 RefWorks is an online research management and collaboration tool. It lets you share information with others and collaborate on projects. You can add optional modules, including ones that give you mobile access. An annual license is $100 and includes feature upgrades and support. Dropbox is a file-synching app that lets you sync files across multiple computers and online. It also allows you to share files with others and serves as an online backup solution. Dropbox is really a hybrid solution: the downloadable app integrates with the Web service, making it easier and more streamlined. 2 GB of storage and transfer is free; bigger accounts are paid ($9.99 per month for 50 GB and $19.99 per month for 100 GB). Zotero is a free Firefox plug-in that lets you capture websites, links, documents and other media. It includes tools to let you organize the information that you capture, including separate files and tagging. It also lets you access your library from anywhere and cite from OpenOffice or MS Word. Desktop tools tend to focus more on file management and less on research and resource management than online apps. If you need to keep a large volume of files accessible and organized, one of the apps below will likely fit your needs. There is an option to fit every budget, operating system and need. Adobe Bridge is a media manager that comes with most Adobe Creative Suite products. It makes managing your creative assets easy, with features to keep files organized and easy to find. 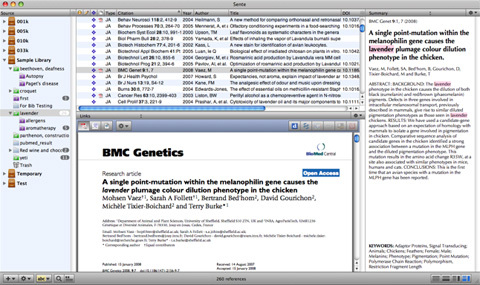 Papers is a desktop app for organizing your research into your own personal libary, iTunes-style. 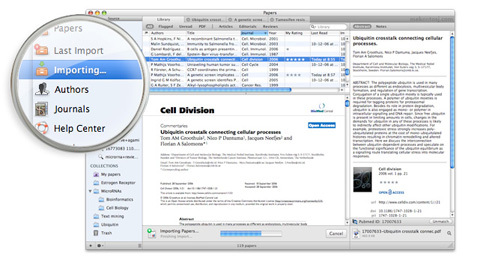 You can organize research into collections, search within your library, share your research and import from any PDF. Papers is a paid app, but only $42 for a license. 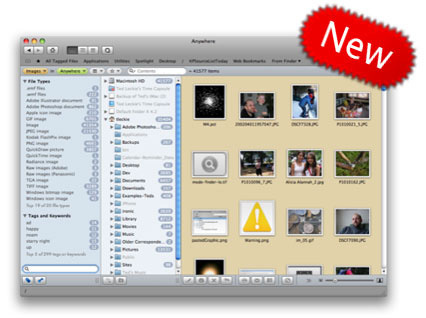 An iPhone version is also available for $9.99, which syncs with the desktop version. Launchy is a complete file indexer for Windows and Linux. It’s intended to replace your start menu, desktop icons and other file managers and be a one-stop app for launching programs and documents. You can set up keyboard shortcuts to access your most commonly used programs faster. 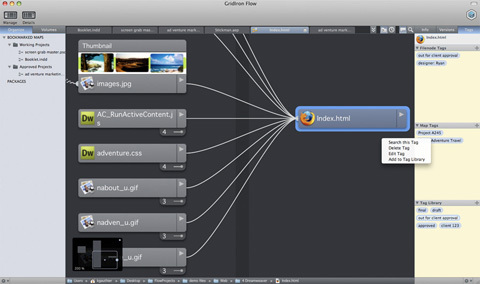 Flow’s approach to file management is more visual than most other apps. You can organize all of your project files into a single view and see how they relate to each another and where they’re located (even if they’re on a disc you burned months back). It also includes other handy features for project management, including time- and asset-tracking. The biggest drawback to Flow is the price: a single license is $299, though bulk discounts are available. 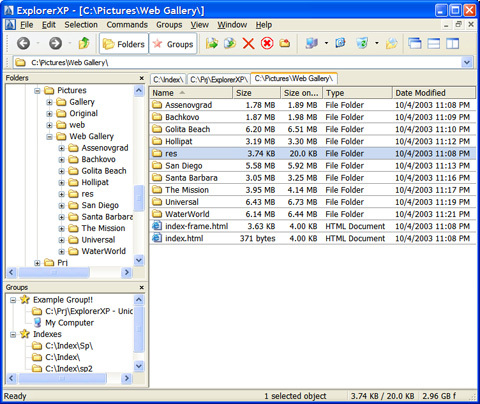 ExplorerXP is a free beefed-up version of the standard Windows Explorer program. Its major differences are tabbed browsing of multiple folders and display of file sizes. 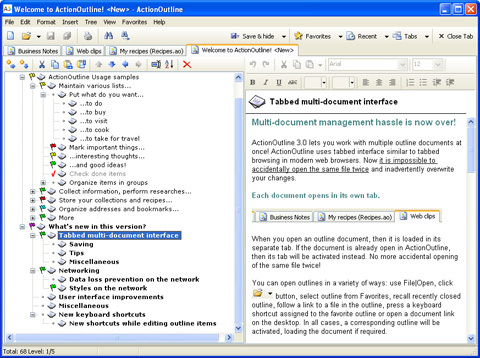 ActionOutline stores information in an Explorer-like tree structure. You can rearrange branches, export to external files, search and otherwise organize your information. Licenses range from $39.95 to $79.95. File Folder Organizer keeps an electronic record of how your paper and physical files are organized. Your documents and files are organized in a tree-like structure, letting you find what you need before digging through a pile of paper. Licenses start at $39.95. Leap is a Mac OS X file manager that uses OpenMeta tag conventions, allowing you to share tags across multiple programs. Leap lets you rate files and organize them in other ways, including grouping similar files together automatically. A single license is $59. 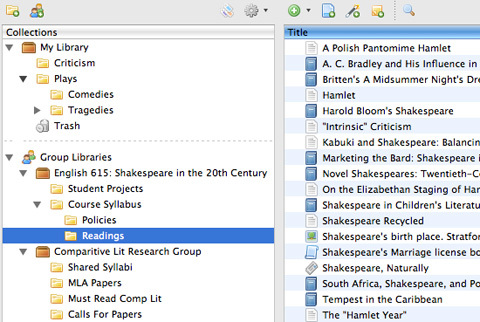 Sente 5 is “like iTunes for academic literature.” It has the familiar iTunes-like interface and lets you store PDFs and other files as well as search online reference databases. It includes plenty of tools to help you find information, whether the information is stored on your machine or somewhere online. A 30-day free trial version is available. Single-user licenses are $129.95, though educational and bulk discounts are available. Fences is an innovative program that organizes your desktop more effectively. 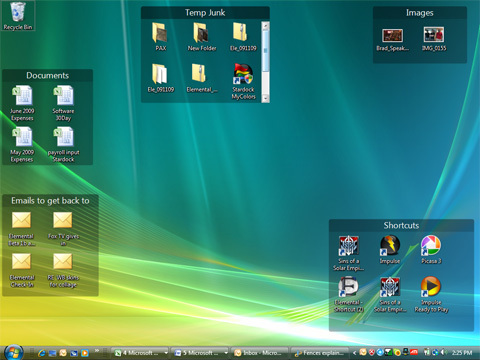 You can shade individual areas of your desktop to group icons and then move and resize them as needed. It’s free for personal use. Not everyone wants to organize their work with digital tools. Sometimes analog works just fine. The beauty of analog apps is that they’re generally low-cost and easy to use, with no learning curve. Here are a handful of tools that people are using to manage their references and research. The Moleskine—that ubiquitous little black notebook—has gained quite a cult following. It’s pretty much all I use to keep notes for story ideas (both fiction and non). 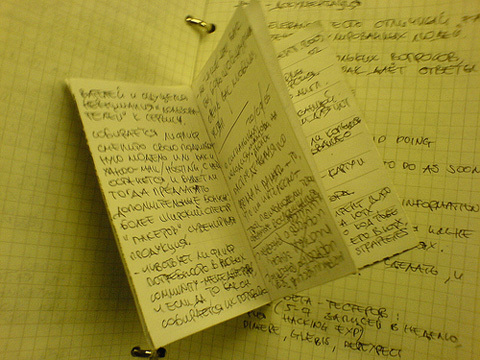 According to the marketing information included with each Moleskine notebook, this is the same type of notebook used by Hemingway, Picasso and van Gogh. People have taken the basic Moleskine, though, and hacked it in a ton of different ways to suit their needs. Whether customizing every page in the notebook or simply adding a few flourishes, people have done just about everything to the Moleskine to make it more practical. This post from Loose Wire Blog showcases how to hack your Moleskine to include multiple organizational tabs. This article from FreelanceSwitch offers a ton of resources for customizing and hacking your Moleskine notebook. This post from PigPog shows the complete setup for a simplified GTD system that could be modified for other uses. 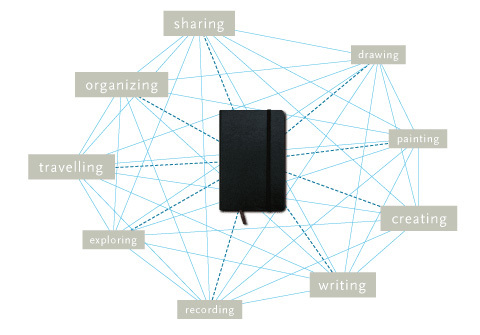 Another article on increasing the organizational capability of the basic Moleskine. The Hipster PDA is a productivity system that was developed by Merlin Mann of 43 Folders. 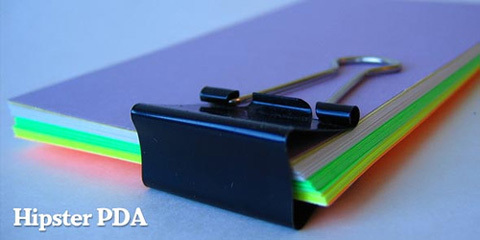 In its most basic form, it consists of colored index cards, a binder clip and a pen. People have taken that functionality to a whole new level in many cases, though, and created templates that can be added onto the index cards (even going so far as to devise a sundial template). A system to definitely check out if you’re into analog tools. The PocketMod is similar in concept to the Hipster PDA but consists of a single sheet of folded-up paper. You can print a new one as often as you like, and there are templates for creating them with just the pages you need. The templates available are fantastic and include everything from productivity and organizational tools to games. Not everyone wants to use new software to manage their files. After all, the point of good file management is to simplify things. Adding yet another app could push you in the opposite direction, depending on your workflow. And with some careful planning, you can adapt to using your operating system’s built-in file-management tools for most if not all of your needs. Managing files using the tools built into your operating system takes a bit more planning and maintenance than using most dedicated add-ons. First, you’ll need to figure out what kind of file structure works best for you. Would you prefer to keep things on your desktop? In your “Documents” folder? Are you comfortable searching for files or do you want to be able to navigate there (this may largely depend on your OS, as some are better at one than the other)? Setting up folders for each major project you work on is a good start. My primary folders include “Websites” (which has files for any Web design and coding projects that I work on, as well as works in progress for my personal blog), “Work” (which contains the blog posts I write for other blogs, graphic design work and other paid work not in the “Websites” folder) and “Writing” (which contains all of the fiction and other writing projects that I work on). I also have primary folders for photos and taxes and other important documents. On my desktop I have two more important folders: “New Fonts” and “New Brushes.” These are where I put new font and brush files that I’ve downloaded but have yet to install (I’m a huge addict of both and sometimes go on sprees downloading new ones for hours). Within each primary folder, I have sub-folders for each client (or each major writing project in the “Writing” folder), and then each individual project for each client has its own sub-folder. This system works well for me, and because I’m on a Mac I can color-code my folders to indicate whether the project is done, waiting for revisions or in progress. Think about your own workflow and what type of file structure makes sense for you. Maintenance is important with this kind of setup. Make sure that you save files in the appropriate folders, or else finding them later may be difficult. Set up a naming convention for your folders and files, too, so that you have some idea of what they’re called in case you need to search for them. Managing references and research with built-in tools is a bit trickier than managing files. The simplest way to do it is to set up a dedicated folder for your research and reference files. You can do this either on a per-project, per-client or system-wide basis. Put PDFs and text documents in this folder. Many people forget one crucial thing with this kind of setup, and that is including where a file or piece of information has come from. For PDF and media files, add the URL of the source as a comment in the meta information; for text files, add it to the top of the text file. Cameron Chapman is a professional Web and graphic designer with over six years of experience. She also writes for a number of blogs, including her own, Cameron Chapman On Writing. She’s also the author of Internet Famous: A Practical Guide to Becoming an Online Celebrity. I use http://www.box.net for online storage and file sharing though I’m not quite sure how it compares to the other online services mentioned. very useful we often forget about file management and how much been organised can help in projects. SuperCat creates a searchable index (catalog) of your files. You can use it to easily locate an item on your PC or to check for duplicates and more. PrintFolderPro is handy utility for creating a printable tree of your system. It has some very powerful options and has saved me plenty of times. P.S. In your travels to prepare this post, did you happen to find a program that can manage files between 2 local directories like most FTP clients do between 2 sources? (File name, date, size same — Replace Yes, Yes To All, No, No To All) — but with the opportunity to set rules so you can do some stuff automatically? Its main advantage is that it can automatically download information from the internet, and via its plugin technology, it can be adapted to any online database source. You can also specify plugins for formatting the bibliographic data. It’s awesome for all those random tidbits you find and want to keep, but its also great for work projects, keeping client info and files handy and easy to find. I even use it to keep gift ideas for my family. while you’re browsing and see something you want to save for later purchasing, just hit the same command+P and the tagger window pops up with the webloc for the page you’re on. very handy! a quick tag with ‘gift ideas’ and ‘mom’ tucks it away for later. What a great article, I have seen some, but most of these are a new find ! Nice roundup! Thanks for the mention of Fences, I’ll get it now! A note on Launchy: I was a former user of Lanuchy, and sure it’s a nice app, but somehow I find it slow when indexing (and later accessing) large amounts of files across multiple external USB disks. I ended dropping Launchy for an alternative: Everything. This little free program is way much faster, it indexed my 2.5TB of data in 1/4 the time it took Launchy (and much more faster than Google Desktop, by the way, although I understand GD indexing if far more complex). Launchy is very more UI appealing and has more eye candy, but for someone wanting a faster lightweight alternative, try Everything (found at http://www.voidtools.com). Nice variety of tools , but I prefer Dropbox the most . Really convenient, simple and it can save lives lol. So, what happened to the mother of all good file management tools, aka Total Commander? Why should I use some crappy Exploder replacement when I can get the full monty with all useful bells & whistles, but no usability crappers like you usually get it with windumb programs? That things actually THAT good I’m even using it within Linux (thanks to current WINE packages, that works out pretty nice) which is my primary OS on my dev workstation. Surprised you didn’t include the wonderful Action Method products by Behance (http://actionmethod.com/). I use their paper products when in meetings, and their online version when I’m at my desktop. The iPhone app helps keep it all connected. I also use their note-cards for my “energy line” board, which helps me manage all my products at a glance. They’re perfect for creatives like me. Great list, though, and thank you as always, for the relevant content. I agree Shawn – where is action method? I use the online and paper version and have a great reference library of files and links associated with projects. thanks for this creat article. great article, thanks for nice resources.. I swear by Evernote. Even use it for my To-Dos. Sync 2 workstations and an iPhone for ubiquitous access. Life-saving piece of software. It is one of the nice article i have read this weak,I really like the way how they show the different type of online project management tools with the help of different types of slides. For organization, don’t forget about Springpad (http://springpadit.com) which is a great tool to organize content, personalize it, and share with others. For example, you can save recipes from all over the web, add them into a weekly meal planner, and print out the ingredients for a shopping list. You can also see what your friends are “springing.” The data can be easily dragged from one list to another, and with many apps, the data is given better use – like a restaurant planner working in conjunction from Yelp to help you see where you’ve eaten, your notes about those restaurants, and a way to mark which restaurants you want to go to. Dropbox is highly recommended. Total Commander is also great (but a little complex). Evernote is great for some users, OneNote or iKnow for others. I love Dropbox. It does exactly what it says and just works. It’s fantastic. Cameron, you might want to include a mention of Mendeley in your ddesktop tools section. It’s a definite productivity enhancer for anyone doing academic work. It takes all the PDFs of papers you’ve got laying about your hard drive, extracts the citation information from them, and organizes them. When it comes to to write a paper, you can cite sources with a click and let the program keep your bibliography properly formatted as you add or remove citations. Yet another very good tool – PictureImp. it baffles me that no one ever mentions the ONLY file management tool… in this post Norton Navigator world. i don’t know how anybody lives without it, for file management or archives or http://ftp... if you work at the computer all day and don’t use it your wasting hours a day. I’ve used the pocketmod for a few years & love how convenient it is. This is a fantastic collection of tools! While I use many of the applications (and analog tools) mentioned here, several of them were fresh. Specifically, Open Atrium and Papers are very intriguing applications for organizing my research and DIY projects. Dropbox is by far my fave collaboration tool. You can share individual folders with different email addresses. You can get up to 8 gb of space free by referring folks. I am considering upgrading to the $10 a month plan- 50 gb of storage. Can’t really beat having all my graphic design files automatically backed up every time I save one. Your ideas are very good and I like opinion! made me dizzy no reset button what the hell? XD This is retched. If possible, as you gain knowledge, would you mind updating your site with more information? It is very ideal for me. There are so many file management tools available on the Internet. One of them is FRSFileMgr. 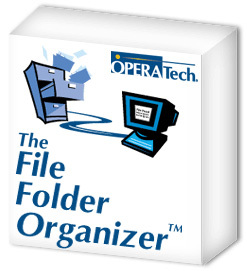 It’s not so popular like Total Commander but it is useful when you have to work with files and folders. Interesting list you got there. Definitely some good ones among them. You might also be interested in checking out our intuitive file manager.